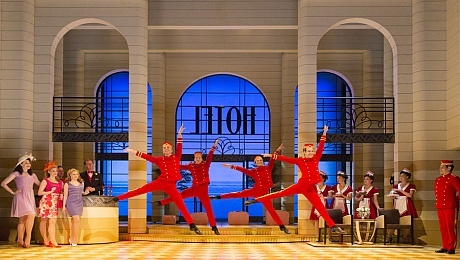 Having watched the publicity that surrounded the West End debut of musical Dirty Rotten Scoundrels (based of course on the 1988 movie of the same name), the big-name cast, the lavish sets, the TV spots, you would be forgiven for thinking that the show was fresh out of the box, but it’s actually been doing the rounds since 2004. It is an unusual choice for adaptation, while the film is remembered reasonably affectionately it was never an out and out smash and has been reduced to a vague memory 26 years on. In a nutshell it’s the tale of two seasoned con men and their attempt to hoodwink a millionaire heiress in the spectacular South of France. 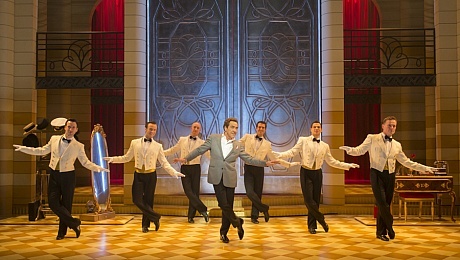 Whilst an amiable enough evening at the theatre it offers nothing new and manages to distinguish itself only by being one of the most old-fashioned (and not in a good way) and sexist pieces of theatre currently on stage. It’s like a bad 70’s sitcom but this time with expensive sets and a top-rate cast. It’s greatest redeeming feature is Robert Lindsay in the central role. Despite the rumours of his difficulty to work with, he really does milk this for all its worth. Without him it would be unwatchable. Pleasant to look at but not a lot more.